Tracking LIC Policy Status is important because it helps the insured to know next premium due date, claim status, accumulated bonus, revival quote, loan status, etc. So, LIC of India Policy Status Enquiry is important for all the policyholders. Here I have provided different methods of checking the policy status in the below sections. Hence, go through the following sections of this article to know about How to check LIC Online Policy Status by Policy Number. Life Insurance Corporation (LIC) of India is the only public sector Insurance Company in India. LIC is the largest life insurance company in India. Life insurance corporation of India has provided different methods to customers to know about their LIC policy status by policy number online. For viewing the policy related information, new customers are required to undergo LIC Online Registration process and those who are already registered can login with their respective Ids. Here, one can also check the Online LIC Policy Status without registration. The Life Insurance Corporation of India has made the life of all LIC customers simple by providing different procedures to know their LIC Policy details. The LIC of India Policy Status enquiry helps you to know the status of any of your LIC policy. Tracking the status of a policy is important because it allows the insured to know the details of next premium due, claim status, loan status, accumulated bonus, revival quote etc. But every policyholder might have a question like How to check my LIC Policy Number Status online? How to Check LIC Premium due date? Don’t worry here I have given answers to all of your questions. So, after going through this article, you may get an idea about checking the LIC policy status online free. In olden days, customers should visit the branch office for checking the status of their registered policy. It is a time taking process because you have to wait in long queues for verifying the status. But nowadays it has become very simple to Check LIC policy Online status because of the advancement in technology. Using LIC Online service for Registered Users and New users. By calling LIC Customer Care Center. Commenting policy number at end of this page. These are the different methods through which the customers can check their LIC India Policy Status by Policy Number. For checking the LIC Status online you need to follow some steps as shown below. With these steps, one can easily get the LIC India Policy Status. We have explained step by step in detailed procedure about how to check policy status online. Hence go through the following sections of this article and check LIC Premium Payment Status. By checking the status of your policy, you can Pay LIC Premium online easily. Login facility is provided on the Homepage for the policyholders. 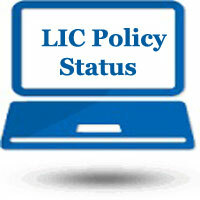 If you are a new user, your should undergo some steps for tracking LIC Login Policy Status. On successful registration, the customer will have access to know information regarding the status of policies, loan, revival, premium due/ policy calendar, maturity calendar etc. The LIC Login New User procedure is as follows. 1. Log on to LIC Official website www.licindia.in. 2. 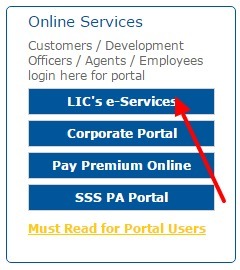 Click on LIC’s e-services option as shown below. 3. 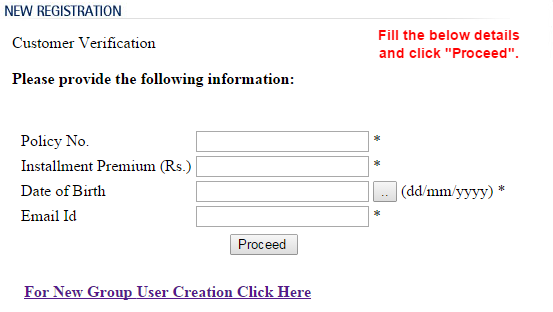 You will redirect to a new page, In that click on “New User” option and complete the LIC Online Registration procedure. Note: Give premium amount and date of birth details as per the policy document. 5. After filling these details click on proceed option, which directs to a new page. Password should be unique and should be kept confidential. By completing this process, an auto-generated message will be sent through mail containing your Login details. By using the Login Details you can view LIC online policy status and other policy-related information. 7. Now you can login as a Registered user by entering your user id and password. 8. Now click the “Go” button; it will take you to the fresh page where you need to click on “View enrolled policies”. 9. By choosing view enrolled policies, It will ask you to enter the text as shown in the image, so enter it and then click on the submit button. 10. Then it will direct to a page containing your policy number. Click on “Policy Number”. 11. Now you will get all the details about your policy like LIC status, maturity date, Premium due date, loan amount, loan interest amount. So, those who are already registered can follow the below steps for lic policy status enquiry online. 2. Click on “LIC Online Services” option. 3. This will redirect to a new page as shown below. In that Click on the “Registered User.” This click enables you to go into a new page. 4. LIC policy status login specifies you to enter Login Id and password of your LIC account. 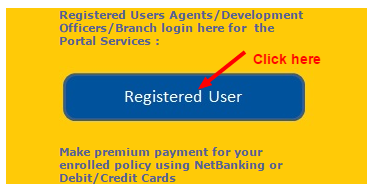 After entering the details, click on “Go” as shown in the image given below, then after successful login, you will have access to check the policy details. 5. The Entered login details will take you to the fresh page, i.e., LIC’s e-services portal. 6. 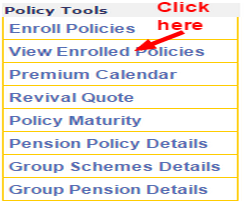 In that click on “View enrolled policies” available under the Policy tools section as shown below. 8. After that, your enrolled policy with policy number will be viewed, Click on the policy number. 9. After clicking on Policy number, your policy status will be displayed on the screen. Policyholder might have several questions in their mind like how to know LIC India policy status? How to check LIC of India policy status without registration? How to find LIC Policy Number by Name? Here you can get the solutions for those questions by LIC policy status report. Here you can also view LIC of India policy status for any of your policies. LIC has provided another easy option to know your policy status. That is by calling “LIC customer Care” or LIC status check by phone number in www lic policy status. So, those who don’t have access to the internet can easily find out their policy status through the phone. LIC is providing 24* 7 facility for most of the cities. For that, you need to dial 1251 if you are an MTNL/ BSNL user or type your city code before the IVR number to use this facility. You can use respective helpline number of your city. The LIC customer care number of each city are given in the table below. LIC of India has introduced LIC SMS services for policyholders. Now you can get LIC policy status by SMS. That means by sending a text message using a Mobile phone, the insured can know the status of LIC policy. Since this is a free SMS information system, it will be helpful to all the LIC policyholders to get policy and servicing details. By this way, you can check your LIC policy status without login. Through SMS service you can enquire about LIC Individual Policy or LIC Pension Policy. ASKLIC < POLICY NO > PREMIUM/REVIVAL/BONUS/LOAN/NOM and send to 9222492224. Please leave a Comment with your policy Number with what information you want to know like premium amount, surrender value or bonus amount acquired. We will post you the information on your Queries. Surrender Value: The value payable to the insured when he/ she decides to terminate the policy before the maturity of the policy. Surrender value is payable when full premiums are paid for Minimum of three years. If you have paid premiums for 3 or more years but less than 4 years and wanted to surrender the policy, 80% of Maturity Sum Assured will be paid as surrender value. If you have paid premiums for 4 or more years but less than 5 years, then 90% of the Maturity Sum Assured will be paid as surrender value. 100% of the Maturity Sum Assured will be paid when 5 or more years premiums have been paid. If the insured wants to surrender the policy before 3 years from the date of commencement of policy, nothing will be given to the policyholder. That is the reason Surrender of policy is not recommended. LIC is providing 24* 7 IVRS facility in cities. Please refer the above LIC customer care numbers table to get LIC Policy Surrender Status. Maturity Sum Assured: Maturity Sum Assured means the Sum Assured corresponding to the term for which premiums have been paid under the policy. Original policy bond of the policy. NEFT form (duly filled along with a canceled cheque) so that the maturity proceeds can directly be transferred to the policyholder’s account. Revenue stamp of Rs. 1/-. LIC is providing 24* 7 facility in cities. Please refer the above LIC customer care numbers table to get LIC Policy Maturity Status. The Life insurance Corporation of India can grant a loan to the policyholder against his policy as per the terms and conditions applicable to the policy. a) Application for the loan. The maximum loan amount available under the policy is 90% of the Surrender Value of the policy (85% in case of paid up policies) including cash value of the bonus. The rate of interest charged on loans is at 9% to be paid half-yearly. The minimum period for which a loan can be granted is six months from the date of its payment. In case the policy becomes a claim either by maturity or death within six months from the date of the loan, interest will be charged only up to the date of maturity/death. LIC loan status can be known through calling LIC customer care number and through LIC SMS procedure. If you want to check LIC loan status through SMS, then type ASKLIC <policy number> LOAN and send to 9222492224. These are the different methods for checking the status. So, the Policyholder can follow any of these methods as per their convenience to check the LIC Policy Status.